Color Splash!® 100% acrylic 4-ply yarn, 3 oz. (150 yards) of yarn per skein. Use for all your craft needs. Choose from 16 fabulous colors: Black, Buttercup Yellow, Indigo Blue, Kelly Green, Lemon Yellow, Light Rose, Lilac, Mulberry, Off-White, Peach, Royal Blue, Sage Green, Scarlet, Sky Blue, Soft Pink, and White. Shades may vary. Non-toxic. Hand Wash warm; cool rinse. Lay flat to dry (dry cleaning is also acceptable). 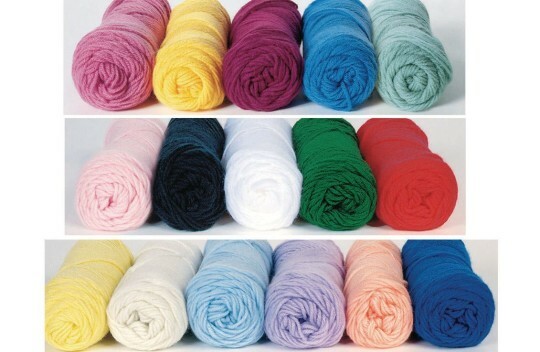 Residents loved knitting with this yarn! We partner with a local public school. In the Winter we supply the kids in need with hand knit stocking caps. This yarn is nice to work with and colorful. I know the kids will like it. We buy this product time and again!